Tension has eased, optimism has been renewed and a wave of jubilation has swept through the country. A long, fraught night in the Pakistani capital, Islamabad, culminated in the government's decision to reinstate the chief justice who was sacked more than a year ago. 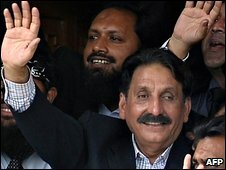 Lawyers who had campaigned for Iftikhar Chaudhry's reinstatement were ecstatic. The public was also happy, because the decision had averted a major confrontation between the two largest political forces of the country, the Pakistan Peoples Party (PPP) of President Asif Ali Zardari and the Pakistan Muslim League - Nawaz (PML-N) of ex-PM Nawaz Sharif. The two parties had together swept the 2008 elections and formed an alliance to rule the country. The alliance was widely welcomed by the electorate as it meant that the two parties would not resort to the political squabbling of the 1990s which destabilised successive governments and impoverished the economy. But the parties drifted apart over the question of the reinstatement of Justice Chaudhry, who had been sacked by military ruler Gen Pervez Musharraf in 2007. Many say Gen Musharraf sacked him because he feared the judge might upset his plans to win a second term as president. Gen Musharraf's successor, Mr Zardari, had pledged to reinstate Justice Chaudhry but was accused of delaying the move because he feared the judge might revive corruption cases against him. Those cases were instituted by the government of Nawaz Sharif in 1997 but were withdrawn by Gen Musharraf's government under the transfer-of-power deal which paved the way for the 2008 elections. That transfer-of-power deal also apparently contained an agreement that would protect Gen Musharraf from prosecution for actions during his leadership. So what backroom deals were done to secure this latest accord, apparently sealed following high-level negotiations in which the army and some US diplomats played a key role? What deal has been done on charges against Musharraf? While the government has apparently agreed to make Justice Chaudhry the chief justice, it is still not known if this will mean a reversal of Gen Musharraf's order to sack him. 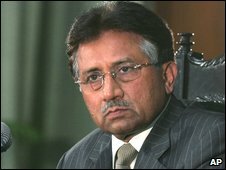 Legal experts say a reversal would expose Pervez Musharraf to prosecution for illegal conduct, something many say is unlikely to happen. If, on the other hand, Justice Chaudhry is being offered an arrangement that does not term his sacking illegal, then the PML-N and some top lawyer leaders may have agreed to let Pervez Musharraf off the hook. Then there is the question of Nawaz Sharif. His PML-N threw its weight behind the lawyers' movement after the Supreme Court upheld a ruling to ban him and his brother Shahbaz from elected office. Shahbaz was chief minister of Pakistan's largest province, Punjab, and had to step down. The central government extended federal rule to Punjab. It seems the government has now offered a judicial review of that judgment. This, together with the decision to reinstate Justice Chaudhry, has rekindled hopes for many that the two parties may revert to the post-election phase of mutual cooperation. There is certainly a growing feeling that politically motivated cases, such as those against Mr Zardari or the Sharifs, have damaged the credibility of the judiciary. But what of Justice Chaudhry himself? Will Chaudhry now be reluctant to delve into the controversial? In the past, he has shown himself to be an independent minded judge, not shy of passing judgments that hurt government interests. He shot down some privatisation deals of the Musharraf government and forced the intelligence agencies to produce political prisoners they had earlier denied they were holding. But Justice Chaudhry has now been sacked twice. First in March 2007 and again in November of the same year. Although, on both occasions, public pressure played a decisive role in his reinstatement, some analysts say Justice Chaudhry may now be reluctant to delve into matters that will prove controversial. The people want justice and the rule of law, but also political stability, democracy and equal opportunity. In the presence of an aggressive media, public aspirations can no longer be ignored either by politicians, soldiers or judges, Justice Chaudhry included.